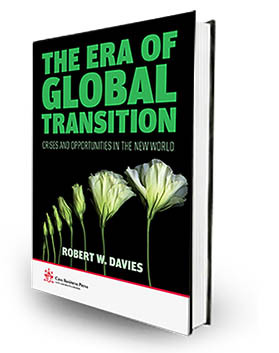 In my latest book, the Era of Global Transition, I set out the key tools and approaches that leaders must use to guide their organisations through a unique period in time as we move away from a unipolar world dominated by the US, to the new and unknown multipolar landscape where new voices and powers jostle to be heard. Managing any organisation through The Era of Global Transition will be the biggest challenge that business leaders will face. Most, probably all, of the assumptions made about globalisation will fall by the wayside and new rules will appear. The Era of Global Transition allows readers to develop their own views of the future and the pathways of change that lie ahead. I provide new tools, specifically designed to tackle this period of transition, which identify who the real architects of a new world order will be and whether or not we face a peaceful or fractious future. Concepts such as the peaceful spread of globalisation, the role of Asia, innovation-led growth, consumerism and even democracy itself are tested and analysed. The book gives debating frameworks to define strategic issues in order to help organisations prepare for discontinuous change and for the shock and the opportunities of the unknown.